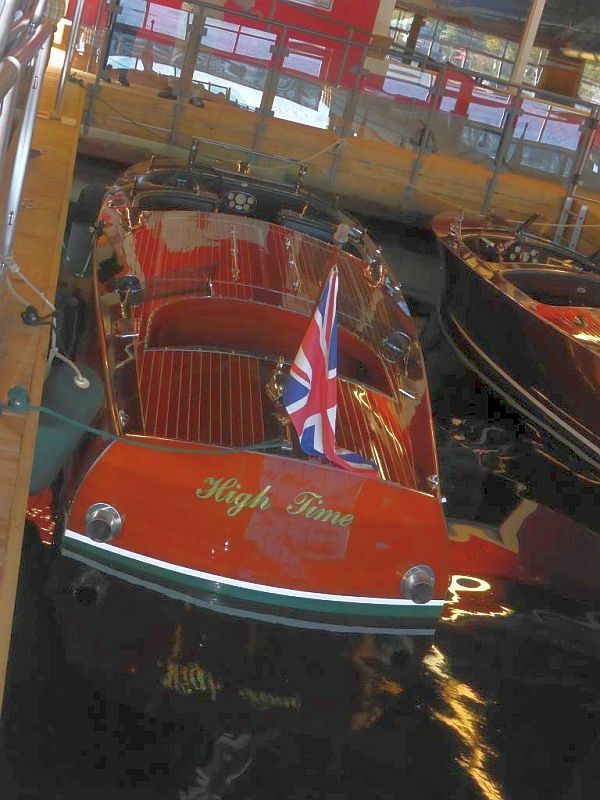 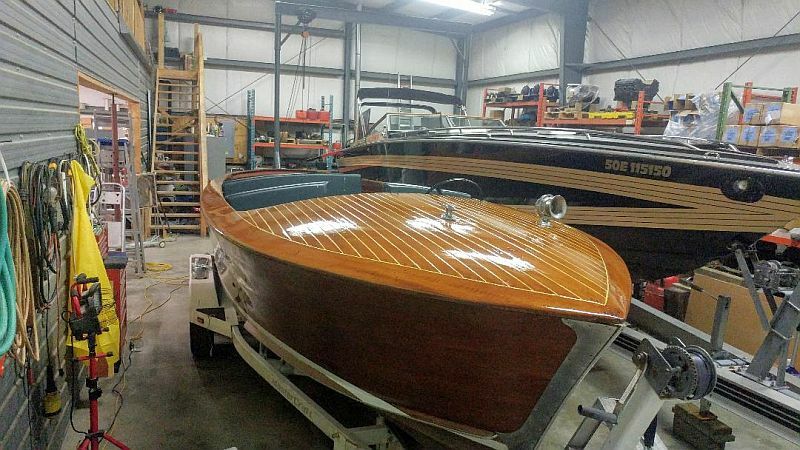 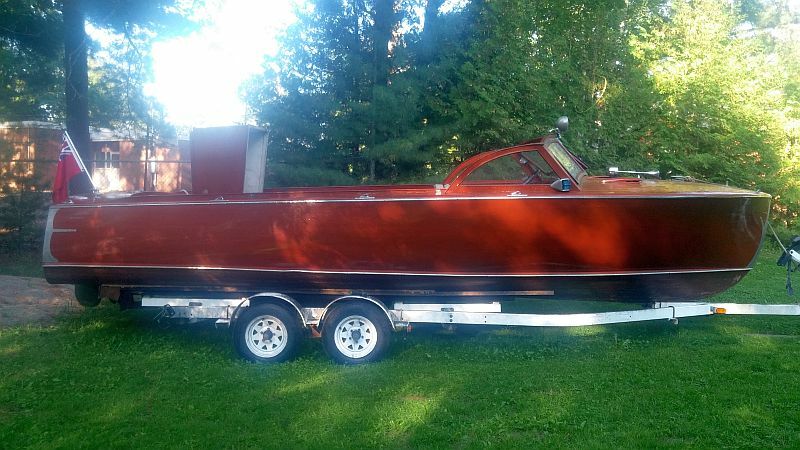 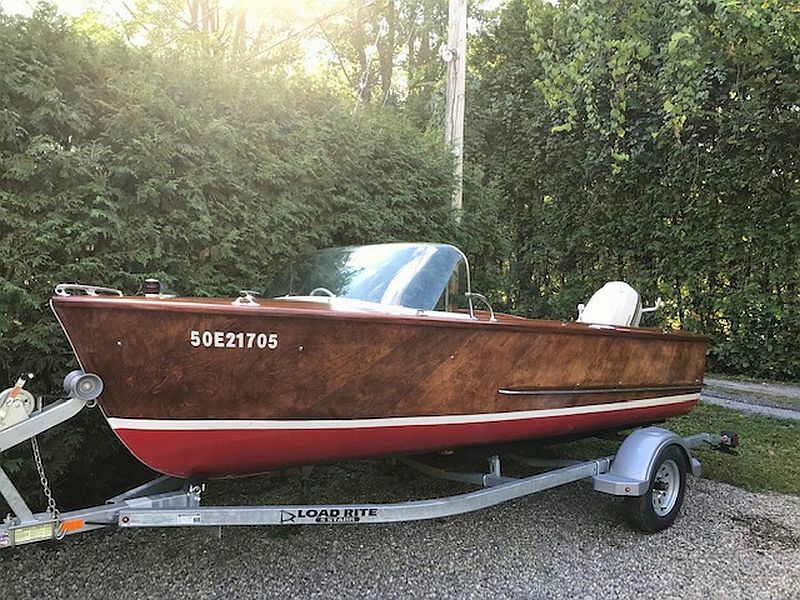 You are browsing the archive for classic boat for sale. 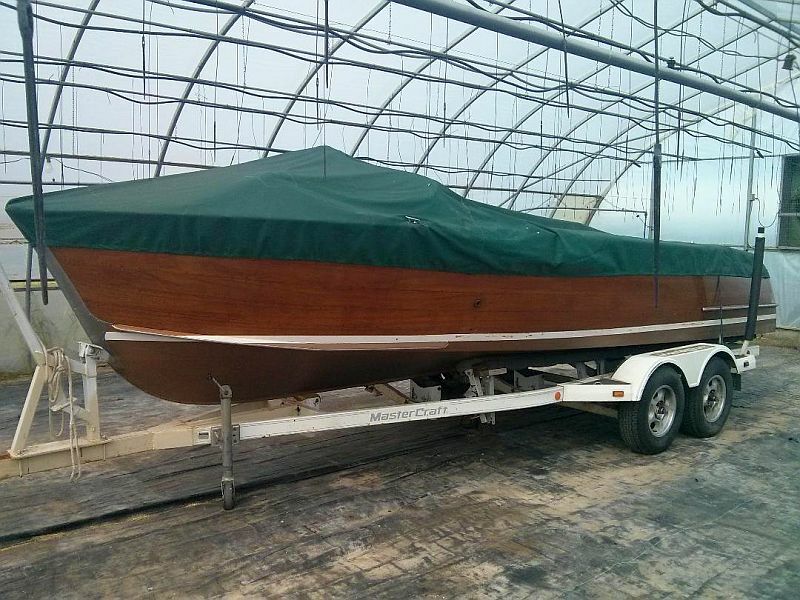 The boat is in need of a total paint and varnish job and new upholstery too. 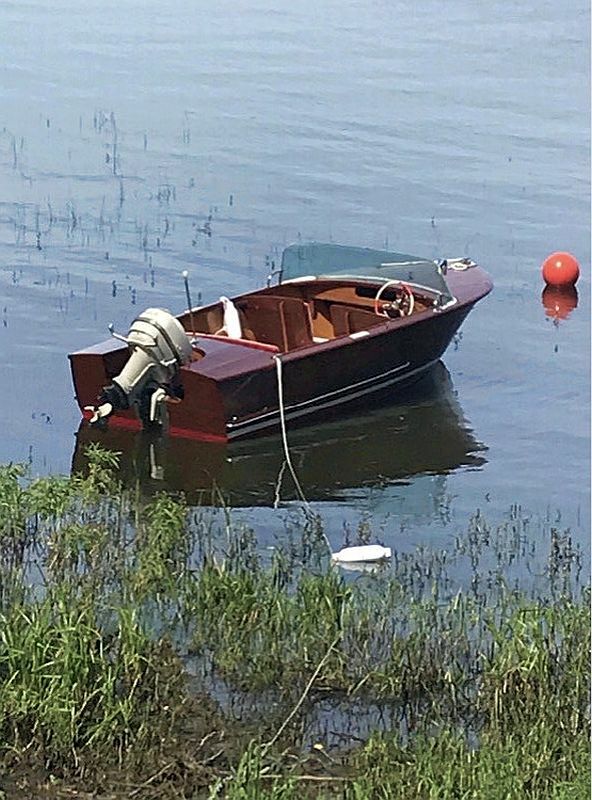 I put the Jolly Giant into the water last summer and got the engine working like a top. 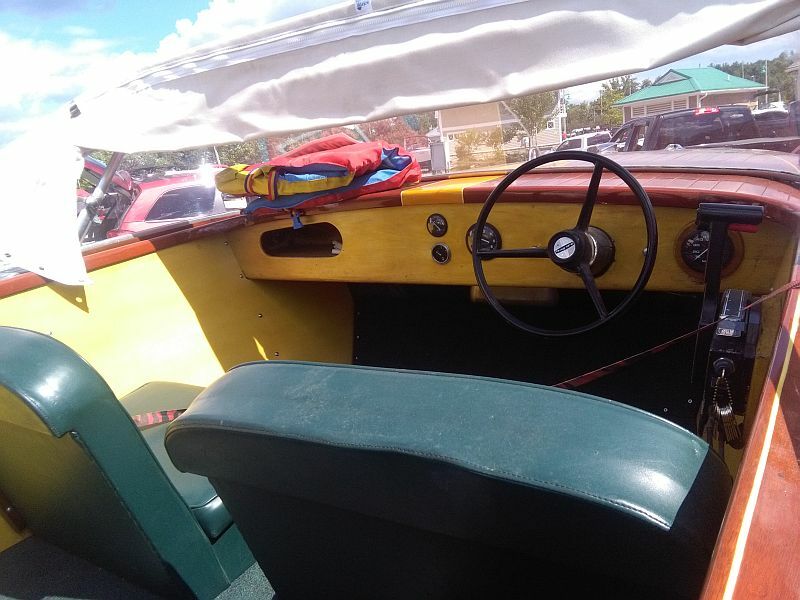 I installed a new gas tank, filters and carburetor. 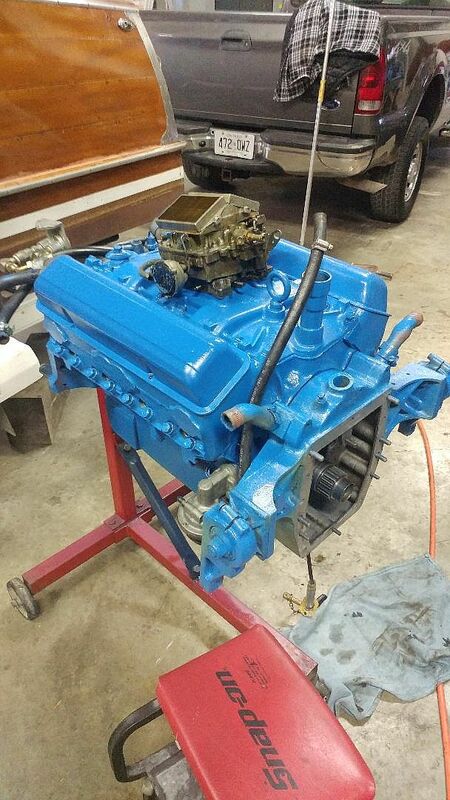 The motor is a Buchannan 283 v8 and looks like and runs like new. 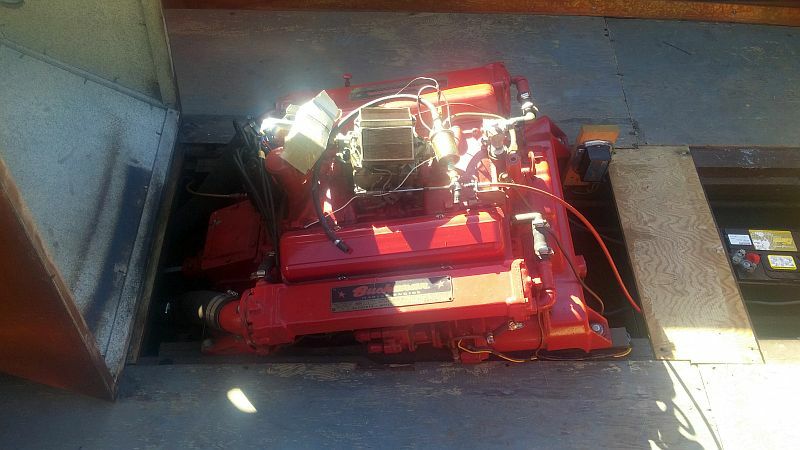 I did a compression test and all cylinders are perfect. 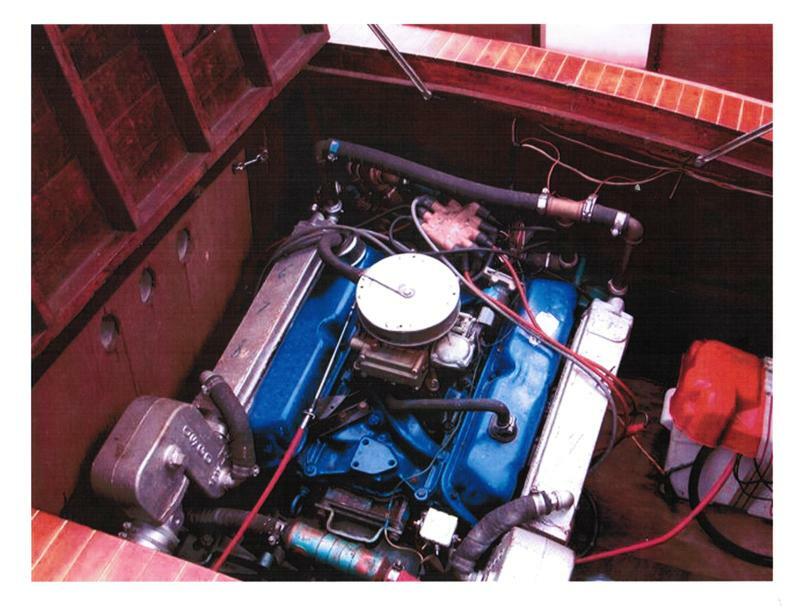 (The engine is a Chevrolet small block V8, marinized by Buchanan, and installed in the 1960s). 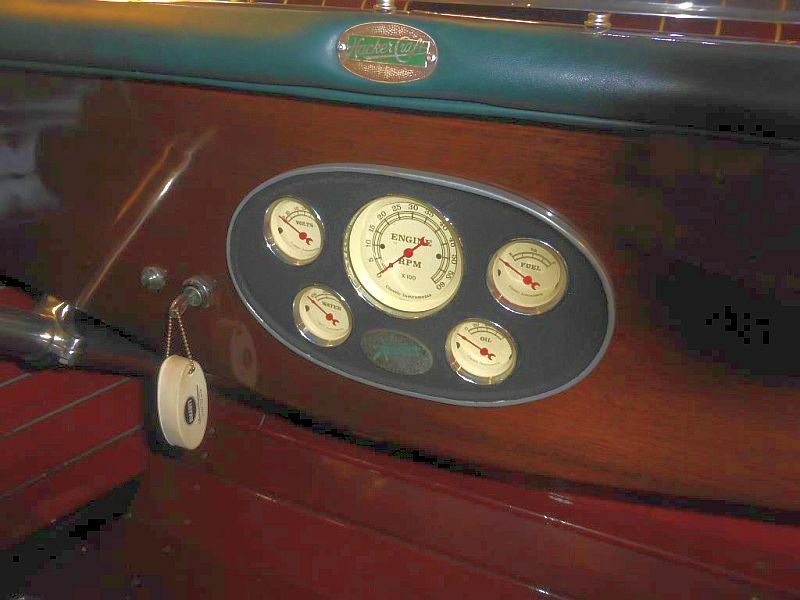 Running time on the engine has been low since installation. 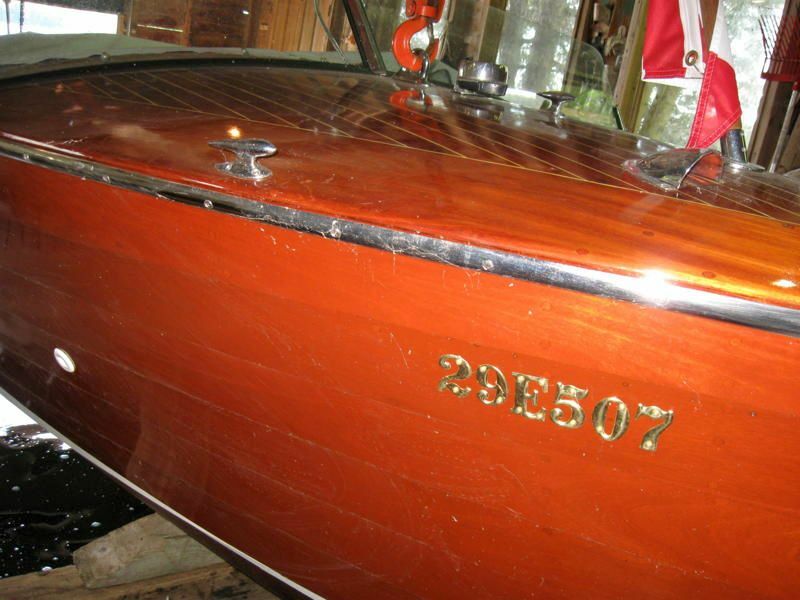 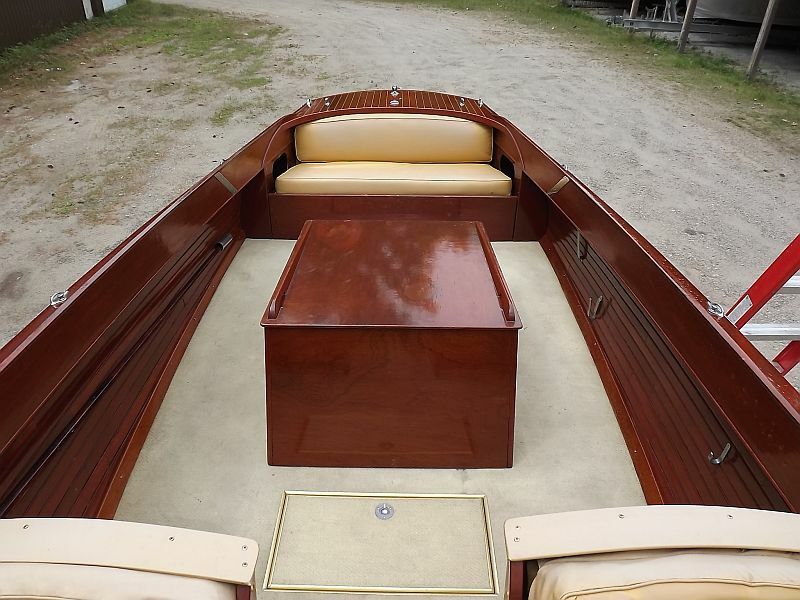 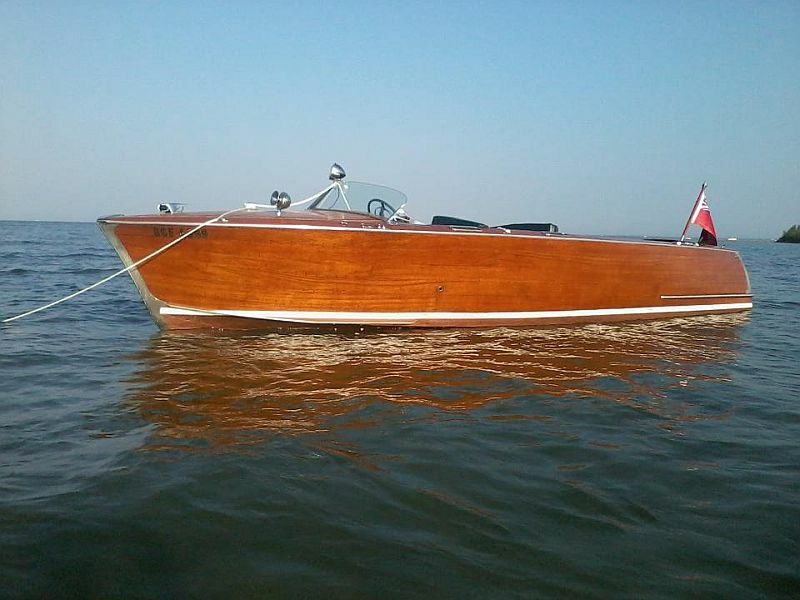 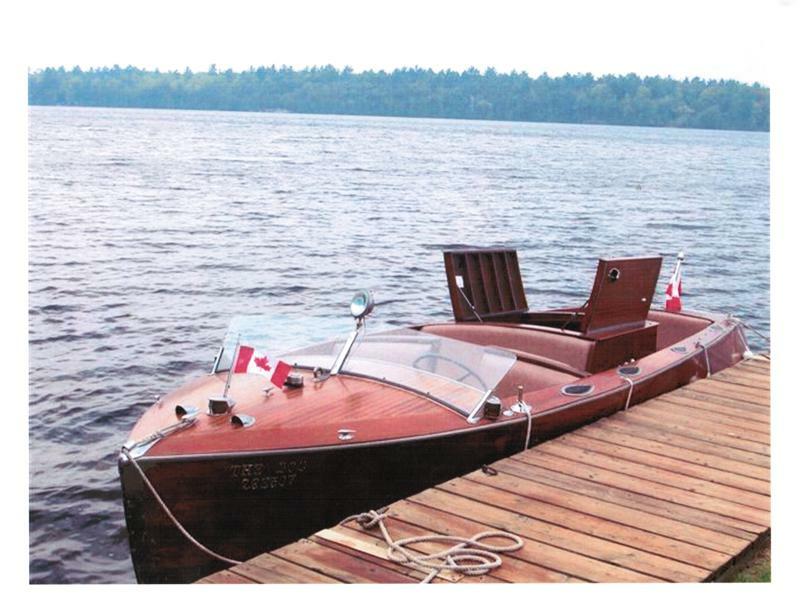 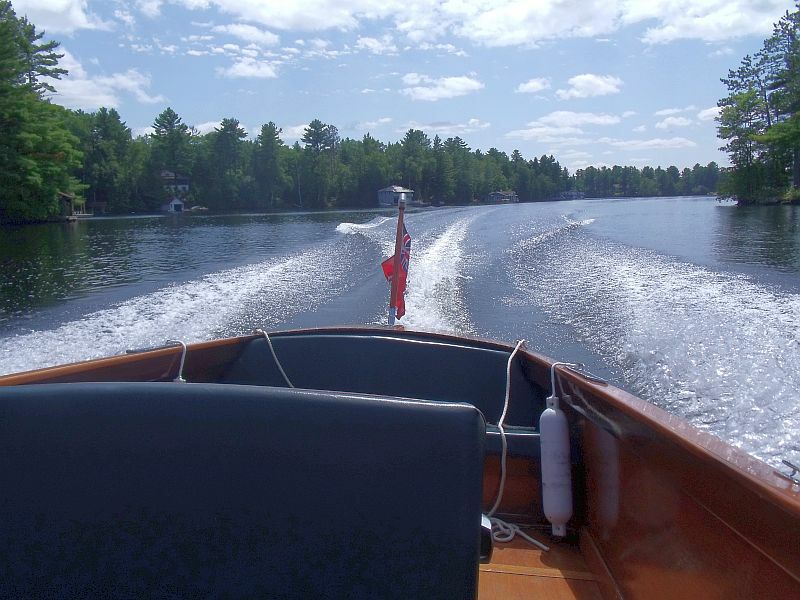 Mahogany classic runabout with Johnson 40 hp outboard motor with electric starter. 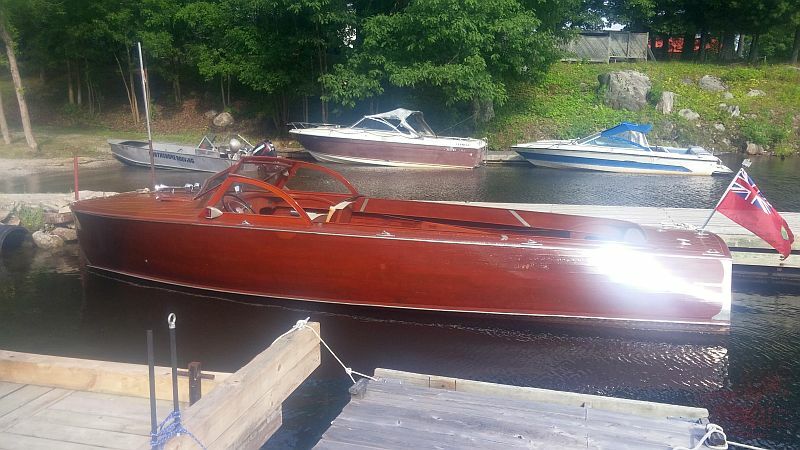 Mahogany with red base and red and white seats and matching steering wheel. 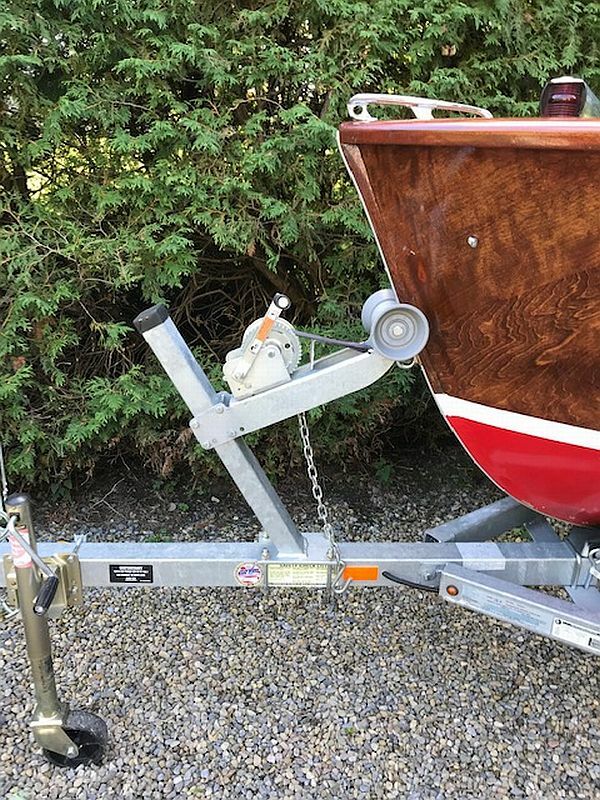 Includes new galvanized trailer and red canvas custom cover and anchors. 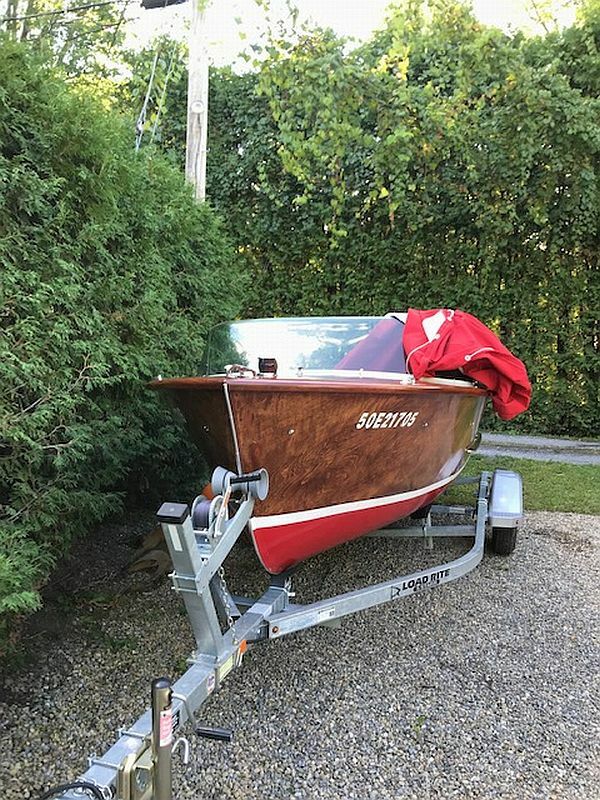 Runabout classique en acajou avec moteur hors-bord Johnson 40cv avec démarreur électrique. 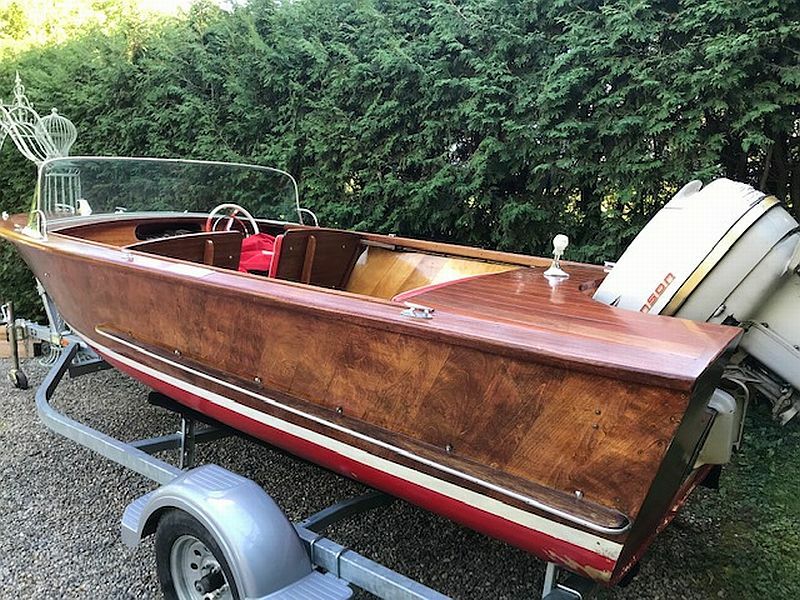 Acajou avec base rouge et sièges rouges et blancs et volant assorti. 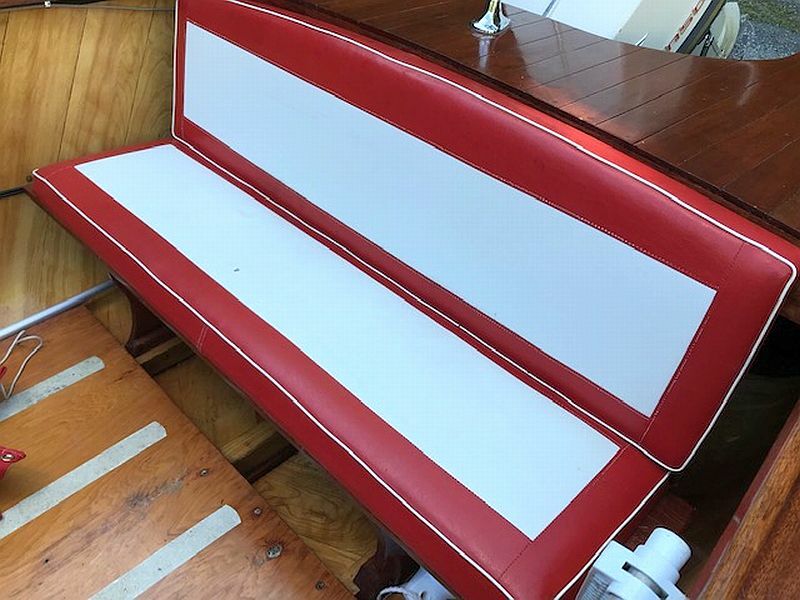 Comprend une nouvelle remorque galvanisée et une couverture et des ancres personnalisées en toile rouge. 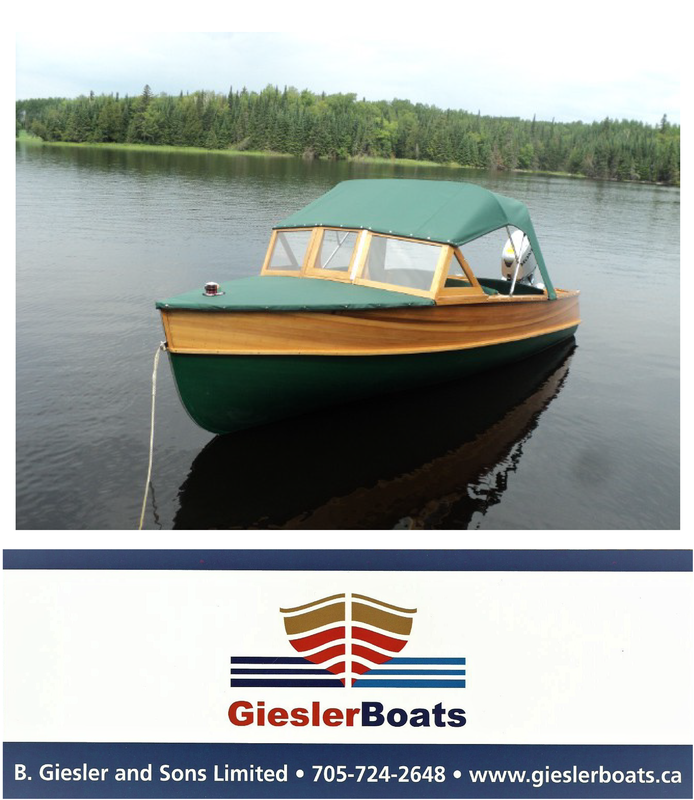 We have been instructed by the owner to reduce the price on this classic Hunter utility. 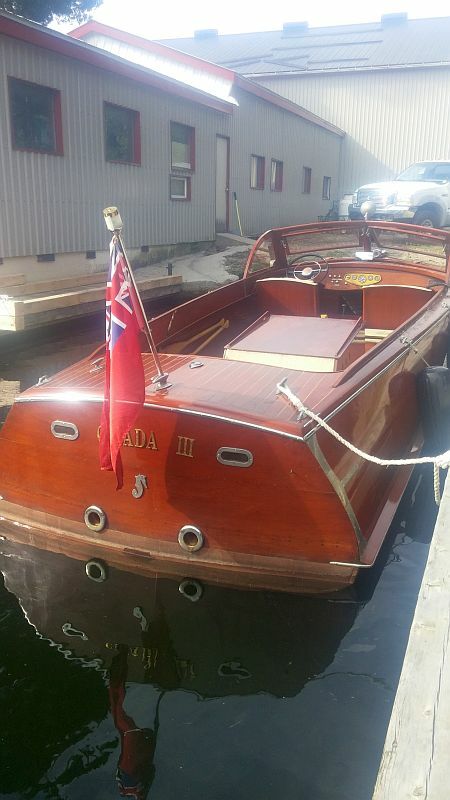 The new price, including a tandem axle trailer, is $15,000 CDN. 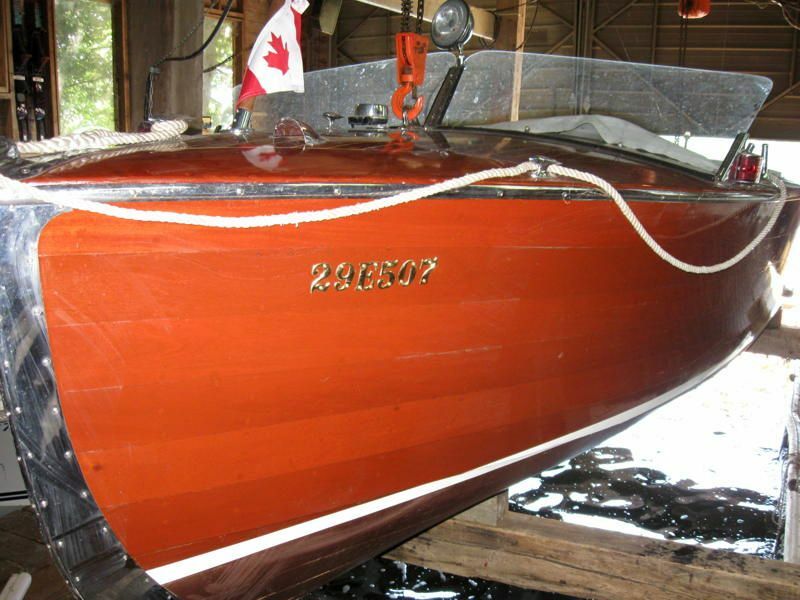 1947, 22.5 ft.’ Hunter in very good condition. 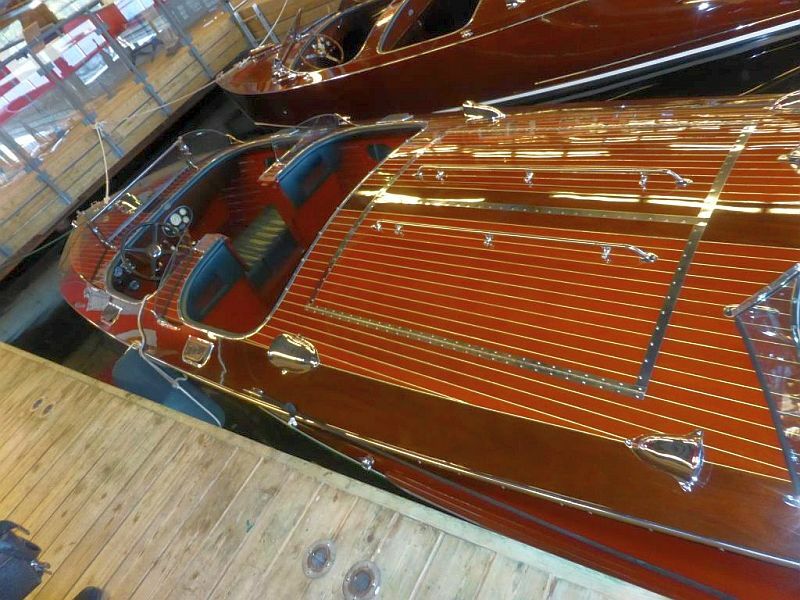 New bottom and frame work in 2000 by Brechin Marine. 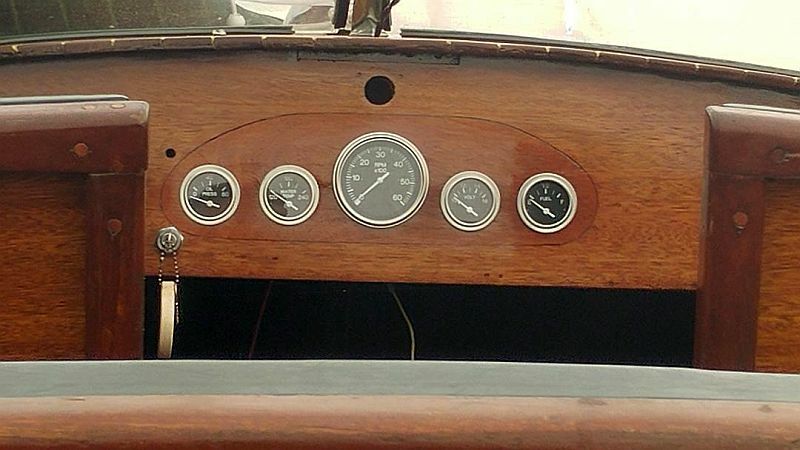 Engine rebuilt and new gauges in winter of 2016 by Giles Marine. 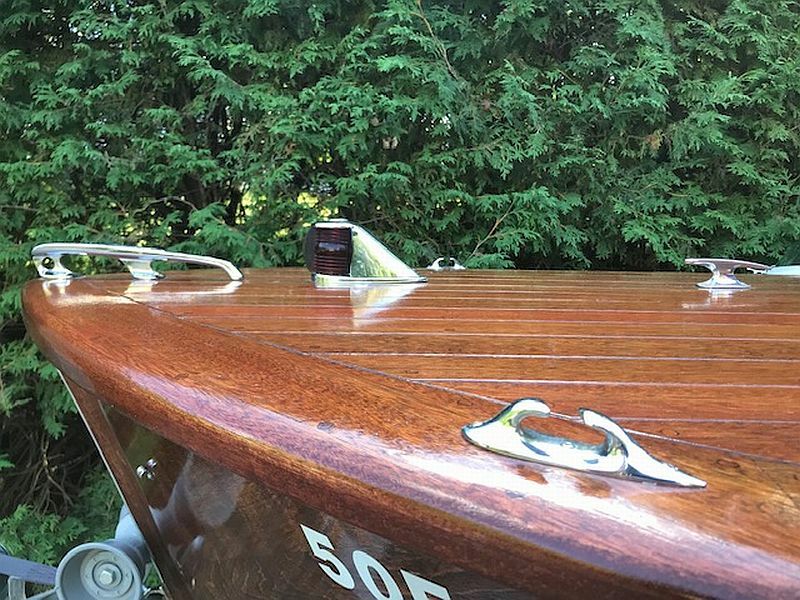 Fresh varnish this spring. 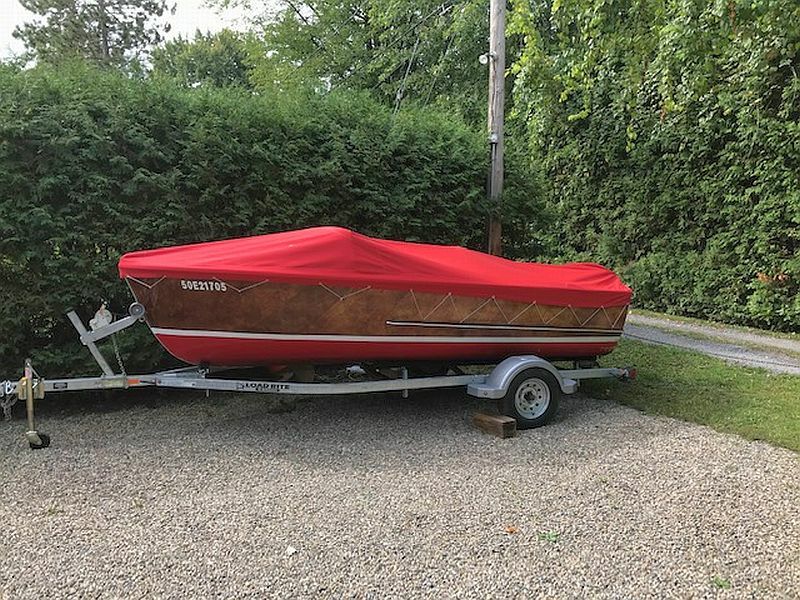 We have used the boat every summer since we bought it in 1996. 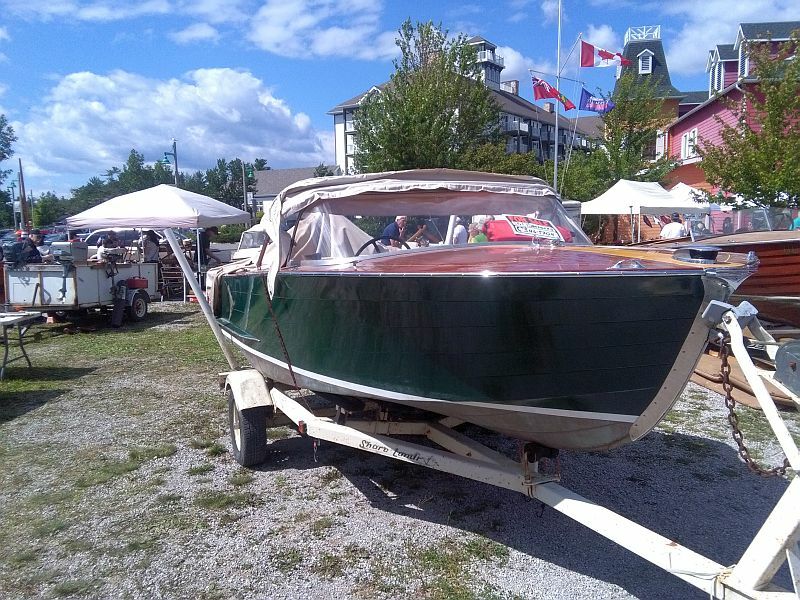 Hunter boats were built in Orillia in the old Ditchburn factory where Ditchburn built their larger cruisers. 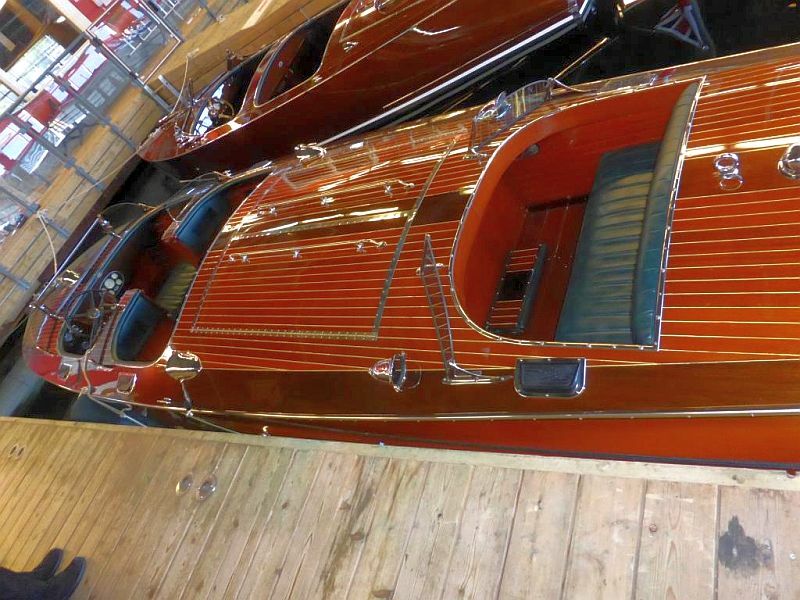 Al Hunter worked for Ditchburn and started Hunter Boats after Ditchburn declared bankruptcy. 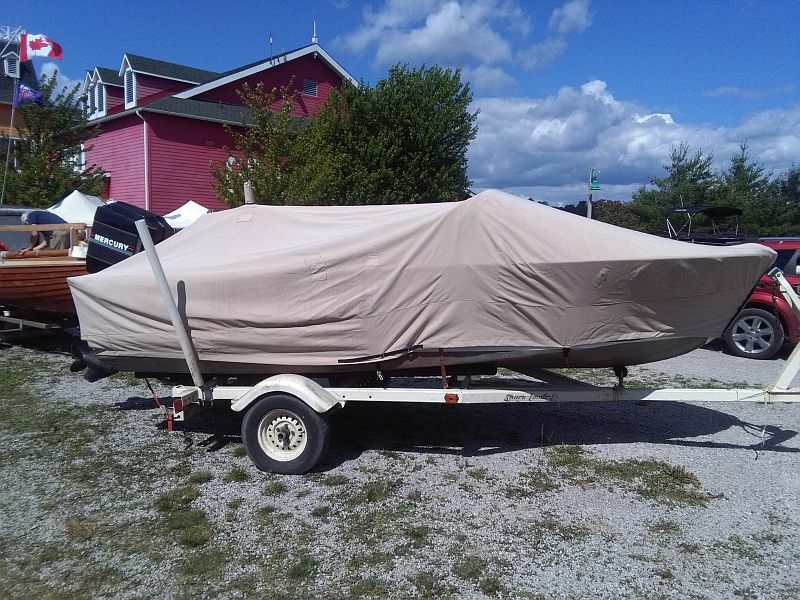 Price is for boat, modified Mastercraft trailer and mooring cover. 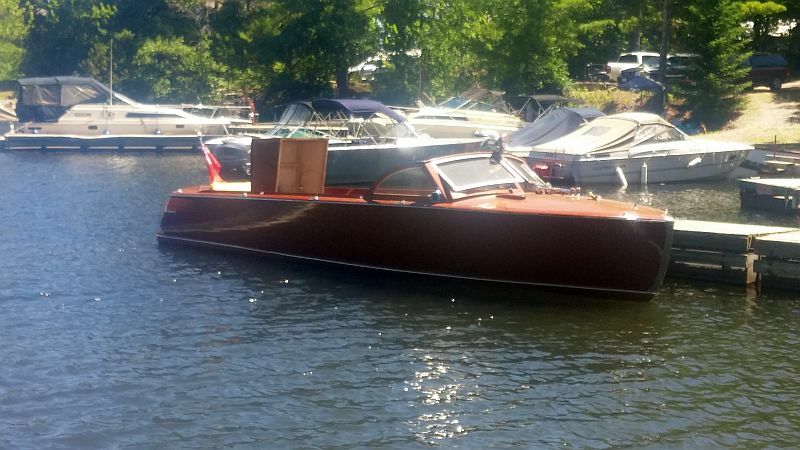 Congratulations to the buyer and seller of this modern-day Hacker-Craft. 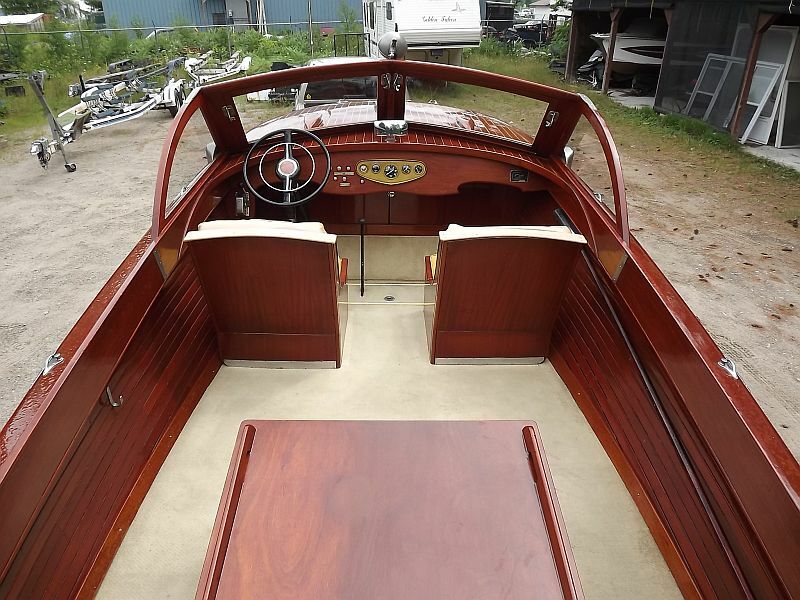 Contemporary technology combined with classic looks make this triple cockpit launch a real show-stopper. 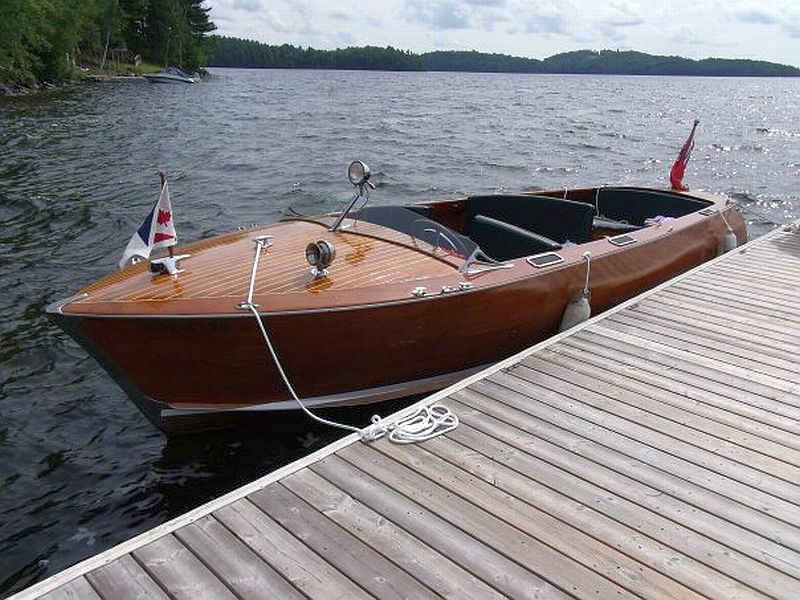 The asking price on the Hacker-Craft was $125,000. 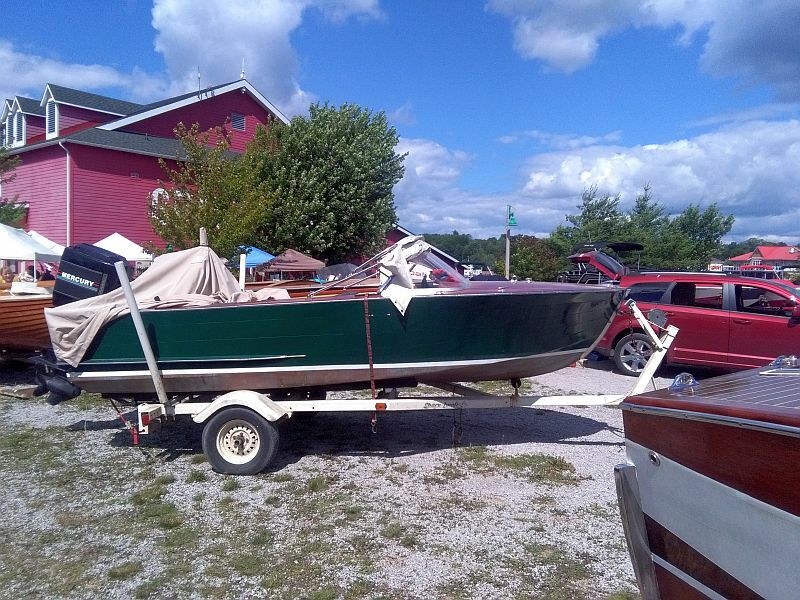 (The owner stated that he received a “good price” for the boat.) 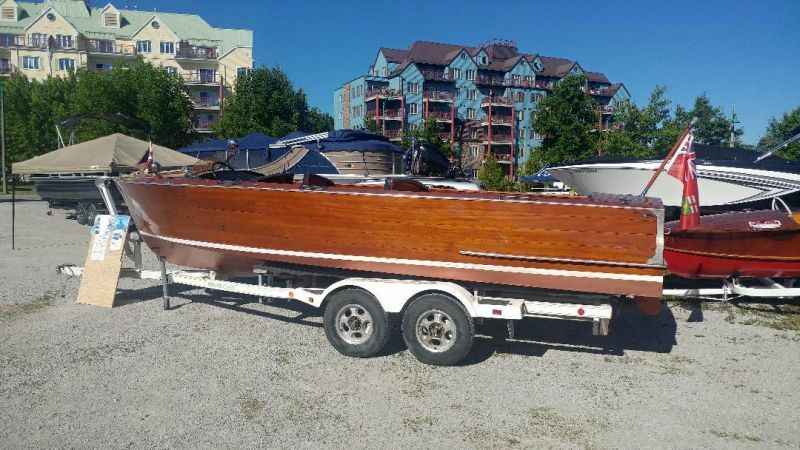 Please see notes from the owner and additional photos below. 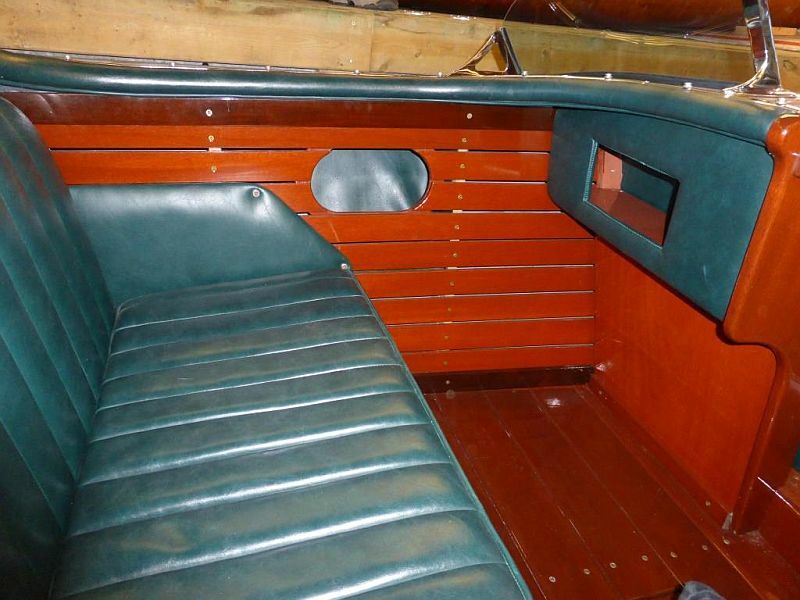 There is wood trim throughout: in all three cockpits as well as the engine compartment. 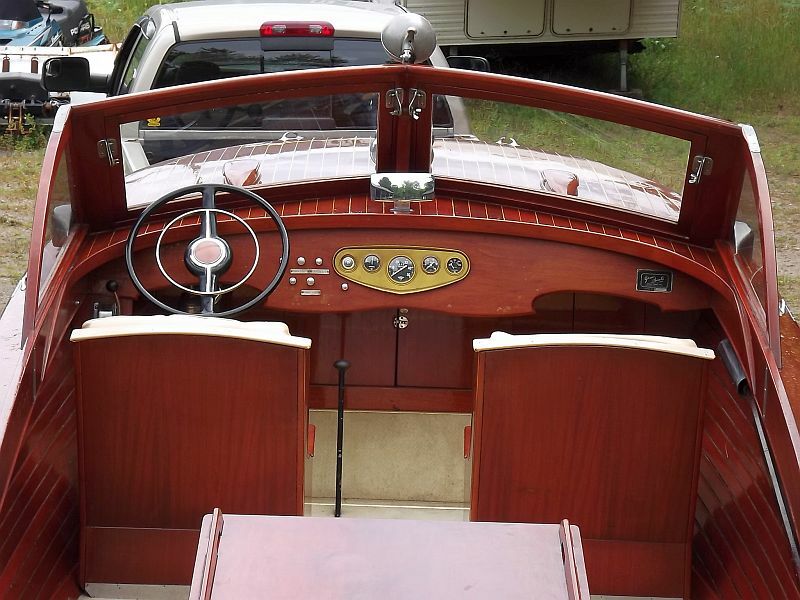 All three cockpits have windshields. 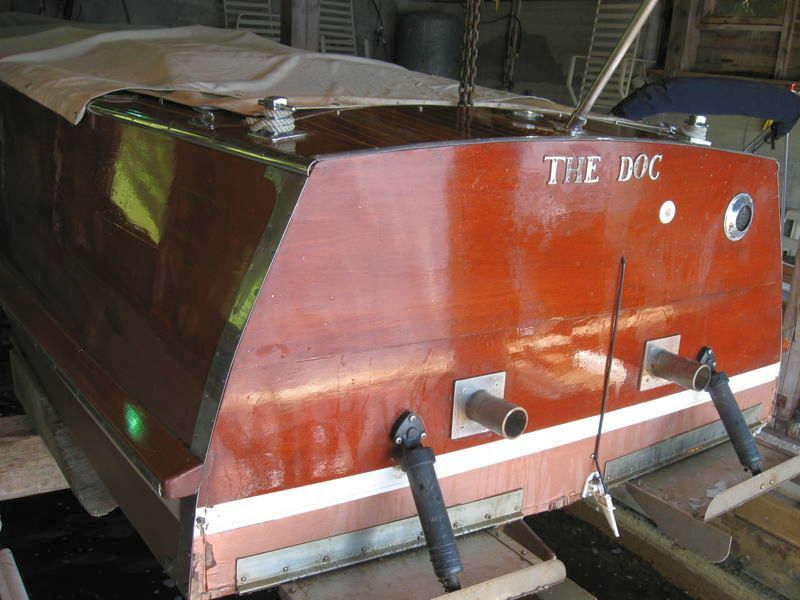 The Hacker-Craft received a new double-planked bottom in 2003-4 and comes with custom paint and exhausts. 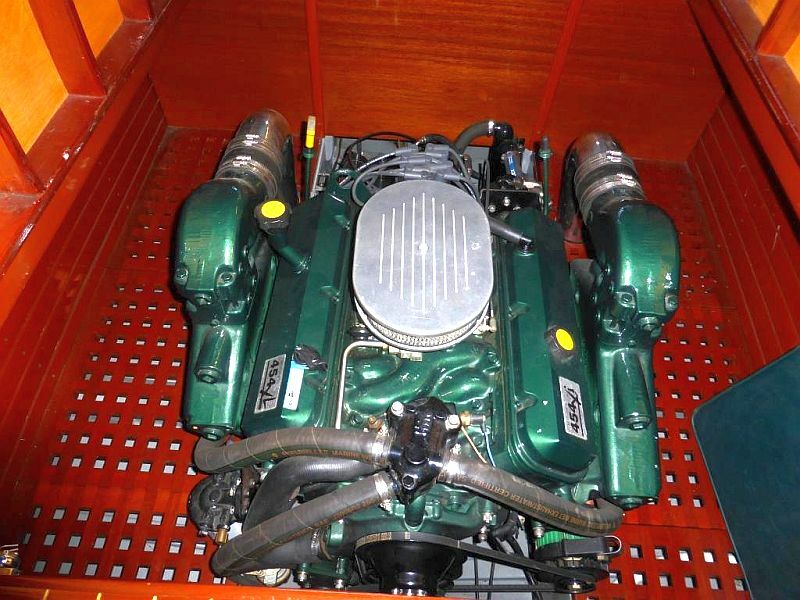 The 454 ci Crusader engine has only 131 hours on the clock. 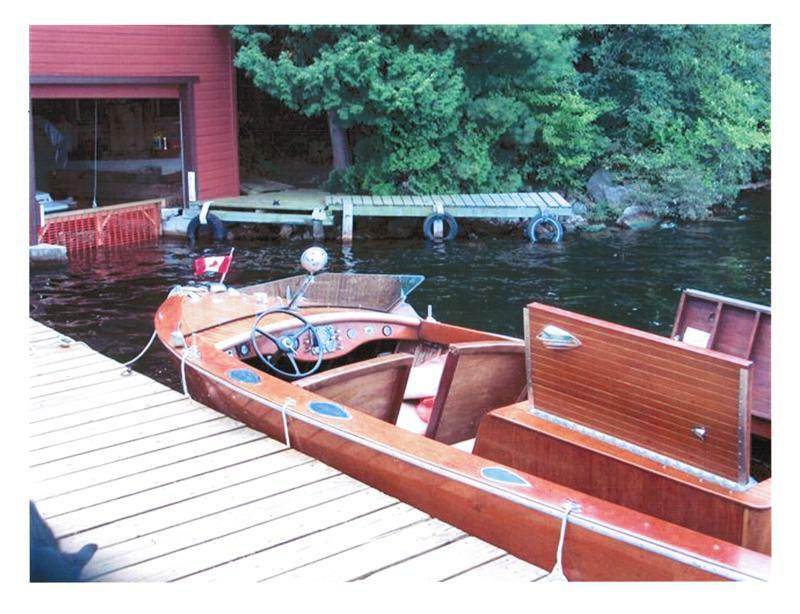 The Hacker has been boat-house kept since new.